Just to whet everyone’s appetite for the Mega Birthday celebrations and get the party started, Vijetha is more than just another cheesy masala film from the eighties. In reading about this film on imdb I discovered that Vijetha was just one of the eight films Chiranjeevi released in 1985. I think that this is an amazing number of film releases, but more so when you consider he had even more films released the preceding year, and just as many the following year. 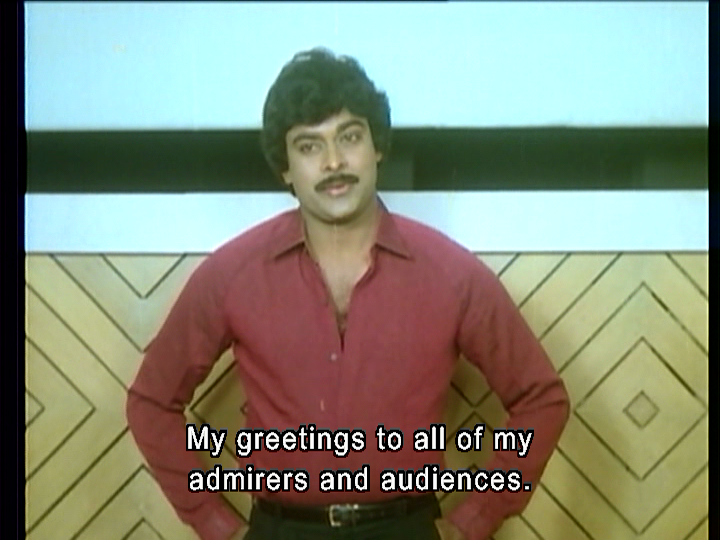 Thankfully this means that there are just so many more Chiru films to watch! Chiranjeevi won his third Filmfare award for his performance in Vijetha and it’s a departure from his more usual action film. In fact, the movie opens with a message from Chiranjeevi to his fans explaining that the story is about a ‘boy next door’ character rather than an action hero, and it makes a great introduction to the story. Vijetha tells the story of Madhusudhan Rao (Chiranjeevi), commonly known as Chinnababu, and his rather close-knit, but at times acrimonious family. With the death of his close friend, Chinnababu’s father Narasimham (Somayajulu J. V.) realises that the squabbling which occurs at the funeral may also happen at his own death. He decides to try to finalise the marriage of his youngest daughter Lakshmi as soon as possible, and to that end arranges a marriage with Sri Rangarao’s son Mohan, a doctor in Chicago. Mohan is planning to marry quickly and head back to the USA and it seems like an ideal match for Lakshmi considering her father’s wishes. The problem however, is that Narasimham cannot afford the required dowry, and so he appeals to his sons for help. But apart from his eldest son’s wife Saraswathi, the others are all disinclined to give any money for a marriage which they don’t see as being as important to them as their own comforts. There is much talk of duty and responsibilities but in the end Narasimham sees no other choice but to sell the family home. Finally after various attempts by the brothers to get the house for themselves, Chinnababu manages to save the day by taking a rather unusual and fairly drastic step to get the required funds and ensures his sister’s marriage goes ahead. The film feels more like a modern-day soap-opera at times as it focuses on the interactions between the different family members and day-to-day life. Chinnababu is a student and aspiring football star, although his father despairs of him ever getting a job as he prefers playing his sport to studying. His eldest brother’s wife Saraswathi has practically raised both Chinnababu and his sister Lakshmi, and she keeps the peace between father and son. Although he’s perhaps a little deficient in studying, in other ways Chinnababu is a dutiful son – running errands for the other members of the family and supporting his father as much as possible. Chiranjeevi does an excellent job of capturing the good-hearted if slightly naïve character of Chinnababu and does manage to portray a more normal slice of life rather than his more usual ‘over the top’ heroics. Although we do get some of those as well when Chinnababu comes to the rescue of Priyadarshini and her friends when they are harassed by some youths, and later on when a gang of thugs attempt to rob him. Bhanupriya plays the love interest Priyadarshini and in another departure from the norm, she stalks Chinnababu rather than the other way around. She lies in wait for him, goes to his football practice and is generally irritating in her shrill and persistent attempts to get his notice. In fact Priyadarshini’s character is incredibly annoying in the first part of the film, and the first time I actually liked her was when she encouraged Chinnababu to play football with the thugs (using them as the football) rather than trying to negotiate with them. Chinnababu initially has little time for her and seems appalled when she moves in to the neighbourhood. However it turns out that a song with some strategically placed cutouts and a large number of cushions is the way to his heart – who knew it would be that simple? After this, Chinnababu seems to be resigned to his fate (maybe it was the gold pants that did it) and Priyadarshini becomes much more tolerable once she finally has Chinnababu’s attention. 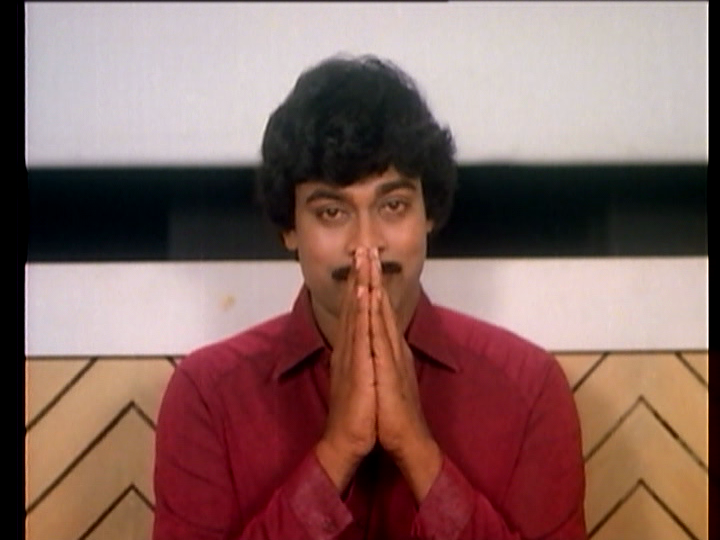 Bhanupriya is lovely despite some of her very questionable outfits, and she can at least match Chiranjeevi’s dancing. She must have really annoyed someone in wardrobe though as she has a particularly bad selection of wigs to wear too! Sharada plays the eldest wife Saraswathi with real grace and poise. Her character works very well as the peacekeeper in the family and her level headedness is very much needed as everyone gangs up on Chinnababu as the only non-worker in the family. There is a classic moment early on in the film where Chinnababu uses her sari to wipe his mouth, and it just goes to show how much she thinks of him as she doesn’t react at all! I also love the set dressing in the film which adds to the ‘family at home’ atmosphere. There are plenty of ornaments, great pictures on the walls and even a medical model later in the film. I would love to know what the brown and green ornaments behind the couple here are supposed to represent. The three brothers show different but equally selfish characteristics and are ably aided and abetted by their various wives. The eldest brother (Ranganath) seems to be far removed from the petty squabbles of his siblings and is able to ignore the pleas of his father despite his wife’s more charitable views. The other two brothers are totally ruled by their wives who are wonderfully self-centred and money grabbing. Most of the comedy comes from their antics although veteran comedic actor Allu Ramalingaiah also turns up as a taxi driver who has some humorous dealings with second son and lawyer Narayana Rao (Nutan Prasad). Allu Arvind was the producer for Vijetha and it seems as if he got the whole family involved since his eldest son Bobby is credited as playing the son of Narayana Rao. There seems to be some confusion in some reviews as this film also marks Allu Arjun’s screen debut, but since he was only 2 years old in 1985 I think he actually appears as married sister Shanti’s son. The confusion is likely because of the very stylish sunglasses worn by Bobby below which do seem to be something Bunny would be likely to wear. The film leans heavily towards family duty and respect but despite these heavy topics it doesn’t drag and keeps a light-hearted tone until near the end. Even then the self-sacrifice of Chinnababu isn’t dwelt on overly much and there is an appropriately happy ending. Director A. Kodandarami Reddy keeps a light touch and stops the film descending into too much sentimentality. The best parts of the film are the songs by K. Chakravarthy and as ever Chiranjeevi is excellent in a seemingly never ending array of tight lycra outfits. This is my favourite and it seems to serve no other purpose other than letting Chiru strut his stuff – I totally approve! I don’t quite see the opening statement quite the same way Heather did. To me it’s not so much that Chiru is playing a boy next door, as lots of his hero roles are those boys at heart, but he is playing a guy who struggles to assert himself and isn’t really a success at anything despite his potential. I think it is that perceived weakness that Chiru wanted his fans to identify with, and he challenged his detractors who may have thought he was a one trick pony. Mind you, Chinna is heroic in his own way. The short shorts and long socks is a difficult look, especially in yellow which I find is an unforgiving colour, but he manages. 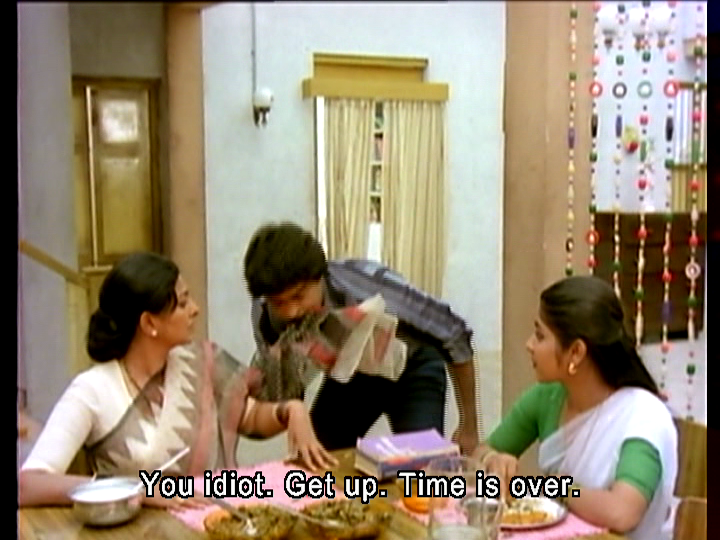 There is some nice social observation tucked in amongst the fluffy filmi fun. This is a family where women have started to work outside the home and their behaviour towards Saraswati is quite masculine in some respects. The father is challenged by his children who have an overwhelming sense of entitlement. Work is hard to come by for the academically average, but class barriers also get in the way – Chinna wasn’t allowed to work as a peon in his brother’s office because it would look bad. Chinna is the product of Saraswati’s intelligent and emotionally supportive upbringing and his father’s strong morality. There is a lot of affection in the family – the father loves Chinna, and had a great time sneaking in to see him play a big match, but the pressure is on to see everyone settled in his lifetime. The question is when do offspring have to take up some family responsibility. It’s similar to, but much less dreary and vomit inducing than, Baghban (one of my most hated films) as the family starts to tear itself apart over money. 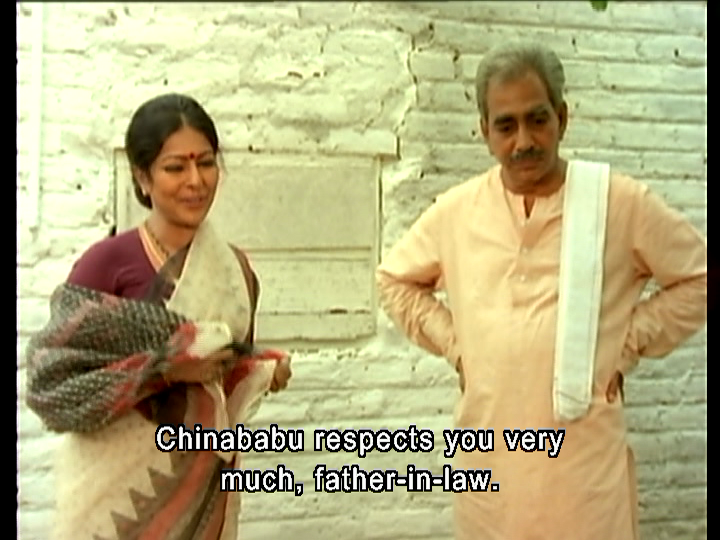 And nicely symbolic as Chinna and his dad unwittingly compete with each other to save the family finances. 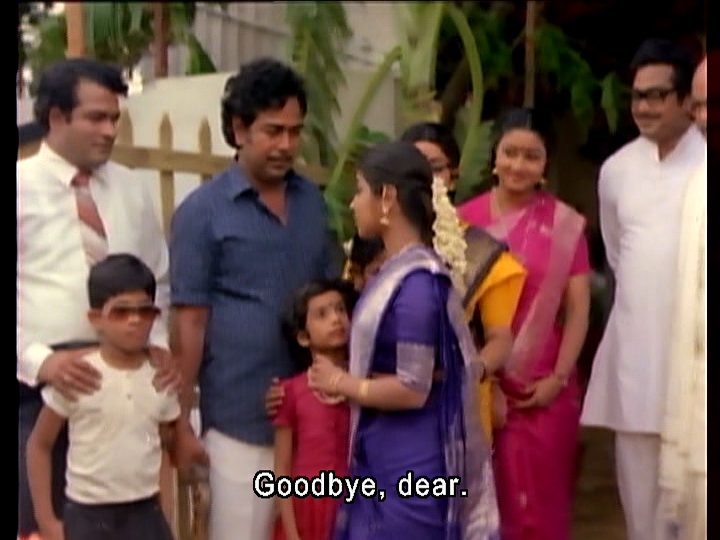 I don’t mind Bhanupriya’s character. Priya is supposed to be a ‘modern’ (i.e. badly dressed, persistent and opportunistic) girl who goes for what she wants. I think her attempts to win Chinna and impress his family are not as funny as they are meant to be, but generally played for laughs and she has good rapport with Chiru. Chinna has the closest relationship with the females in the family, there are lovely scenes as they discuss their hopes and fears together, and Chiranjeevi played Chinna in a natural and low key style. He had a few masala breakouts which I enjoyed immensely, and his flair for comedy is evident. I was so delighted when I recognised the Six O’clock song as I could enjoy it with better dancing (and outfits) and without the accompanying fear of Anil Kapoor from the Hindi version. As romantic musical sports themed family dramas go, this is one of my favourites. 3 ½ stars. This entry was posted in Tollywood and tagged A. Kodandarami Reddy, Allu Arjun, Allu Ramalingaiah, Allu Venkatesh, Bhanupriya, Chiranjeevi, K. Chakravarthy, Megabirthday2011, Nutan Prasad, Ranganath, Sarada, Somayajulu J. V., Vijetha. Bookmark the permalink. I also liked the sister/sister-in-law quite a bit, and I wanted the family house. The dvd cover with the red boots is a bit misleading, since it implies a certain spangly craziness, when the film does have a more grounded realism. I have been resisting leaving comments here having catched up all the posts in this site over a week or so and knowing that comments on old posts is not exactly a great idea. Mohanlal did 35 films in 1986. It’s amazing just how many films these actors manage to fit into a year!